My grandma made the best deviled eggs, no surprise its a well know fact grandmas make the best food. Since my grandmothers passing, I must have eaten hundreds of deviled eggs at party's or social events which have all been disappointing. 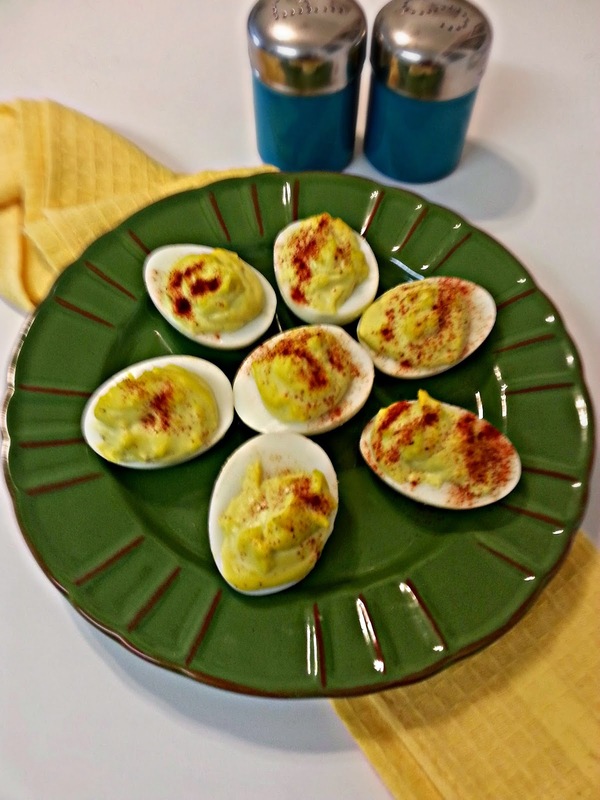 Some favor is always missing in those deviled eggs, and its that tangy or pickled favor. Why did my grandma's eggs taste so much better, What was granny's secret ingredient ? I decide to do some reach, which means consulting with my sister ( my sister seems to remember far more about our family history than I do) and of course she had the answer. The answer, which was simply nothing more than a capful of vinegar. I don't know if granny use white or apple cider vinegar for her deviled eggs, but I used white. The eggs came out amazing and were gobbled up by all, including by my harshest foodie critic my friend Steve.This recipe is the original old time recipe for deviled eggs. Start with fresh eggs if the eggs are more than a week old the shell will be much harder to peel off. 1. Boiling eggs, I used large eggs for this recipe. because of the boiling time Size is important.Place 6 eggs in the bottom of a large sauce pan in a single layer, do not stack. 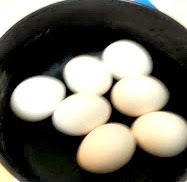 cover the eggs by 1 inch in cold water. 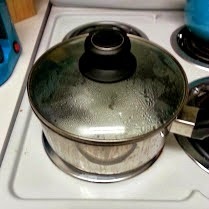 Bring water to a rapid boil on stove, then immediately remove from heat. Cover the pot and let stand for 15 minutes. 2. Cool down after 15 minutes are up, drain eggs and place them in ice water. Let them cool until till they're easy to handle. 4. Give them a roll, roll gently the slightly cracked eggs between the palms of your hands or against the counter top. This well preserve the shape of the inside egg, making it easier to peel off shell. 5. Peeling the eggs, if your using eggs less than a 7-10 days old the peeling should be easy.just gently peel off shell..If your having trouble peeling the egg try running the egg under cold water while peeling.this can help the shell to loosen and come off better. Us a sharp paring knife to cut peeled eggs in half lengthwise. Also A note: see the grey edges around the yoke? I over cooked the eggs I will have to add a bit more mustard to the deviled egg recipe,so that the deviled eggs come out yellow and not grayish. OK now that you have the eggs cooked here what you will need for making deviled eggs. 1. Peel hard boil eggs and cut in halves lengthwise: using the tip of a spoon remove egg yolk from the halves of egg whites. placing yolks in a small bowl,set aside egg whites. using a fork mash yolks. 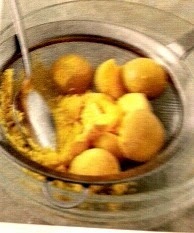 add all the above ingredients to your mash egg yolk and mix well. 2. Stuff your egg white halves with the yolk mixture , using a rounded teaspoon of yolk mixture spoon for each half and using the back of a second teaspoon to carefully push the yoke mixture off the spoon into cavity of egg whites. or you could pipe the yolk into each egg white cavity by using a plastic bag, place yolk in a plastic resealable bag snip off corner of bag and squeeze bag to pipe into each empty egg white cavity cover and chill until serving time, sprinkle with paprika or parsley. I found this on Tuesday with a Twist - thanks for sharing. My hens are laying a lot of eggs now, so I'm interested in any recipe that uses lots of them. 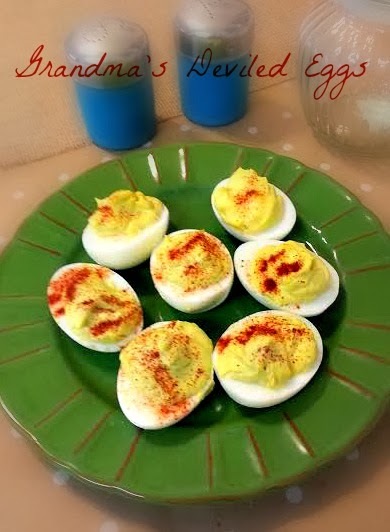 Always like to check out how other people do deviled eggs. Yours look yummy! Thanks for stopping by Janet This recipe is truly delicious, the best i think! Congrats! Your recipe was the most viewed at our Easter Party. We will be featuring it at this week's party. Thank you for linking up your great posts every week! Thanks Lucy T That's wonderful!